Preacher and writer Higginson campaigned for the abolition of slavery, including helping to raise money for John Brown. He fought in the U.S. Civil War, and in his later years wrote in support of women's suffrage and had an advice column in the Atlantic Monthly to help writers. It was in response to this advice column that Emily Dickinson first sent him her poems, beginning decades of correspondence and friendship. Higginson was one of Dickinson's first supporters and edited the first publications of her work, although he is also criticized for editing her work too heavily. 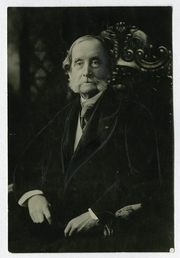 Thomas Wentworth Higginson is currently considered a "single author." If one or more works are by a distinct, homonymous authors, go ahead and split the author. Thomas Wentworth Higginson is composed of 9 names. You can examine and separate out names.